Last night I finished sewing in the ends of this blanket, it was a complete contrast to the last blanket I made as it used a much smaller hook and finer yarn, so progress felt far slower. However, it was an interesting enough pattern to keep me focused without being too complicated. Because the pattern was so intricate, I chose to use a very simple slip stitch border, worked into the back loops only. I wanted to frame the blanket without having the border and main pattern competing with each other. I think it worked really well, and it was also quick to work. The next two projects are lined up already! I love the way this turned out. Very pretty and I agree, the simple border was an excellent choice. 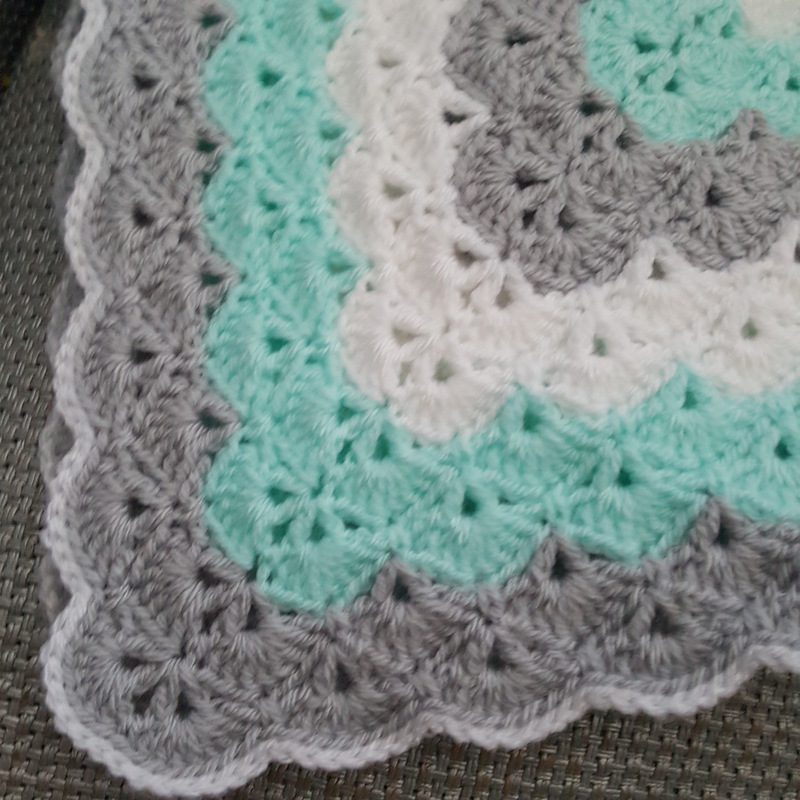 Thank you, I wish I’d known about this pattern when my children were born, it’s such a pretty but simple one to make. That is so pretty and I like the way the border follows the overall pattern. Thank you, I couldn’t lose those pretty scalloped edges. Beautiful and I agree the simple border sets it off perfectly. Thank you, I loved them too, it was tricky to choose gender neutral ones. That’s lovely! I love the border on it, it seems to set it off just right. Thank you, I love the simplicity. I didn’t want to lose the scalloped edges. Oh yes, the border is great. I especially like the effect of going into the back loops only. Great work! Gorgeous! Who wouldn’t love receiving this beautiful afghan? I really like the way this turned out! I remember asking why you would add a border because the pattern is so pretty; however this adds just that extra finishing touch and looks awesome. Thank you for the lovely comment, it was a tricky choice over whether to have a border or not. It’s beautiful! I love the color combinations. Thank you, they’re such gentle colours for a gender neutral blanket. That’s such a beautiful gift; it will be much loved by one very lucky baby. The pattern is very pretty, as is the colours you chose…the result is stunning! 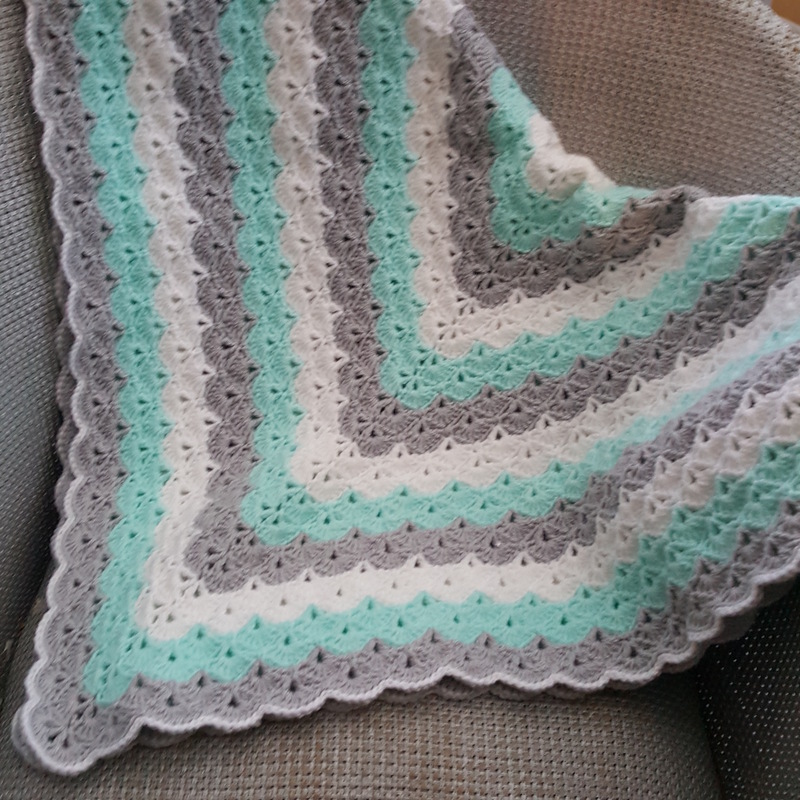 Love the border and I love the colors in this blanket! Gorgeous, gorgeous blanket! I can never get enough of seeing this one. My absolute favorite. The border is perfect and the colors so amazing. Great job! May I inquire where you got this pattern? I love it! Thank you. 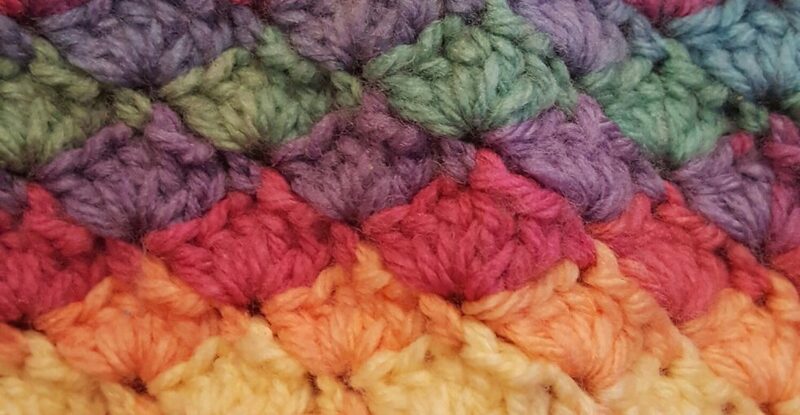 The beautiful shells pattern is a really popular one-there are videos and tutorials for it all over as it’s a free pattern. I’ve a feeling the link I posted earlier in the comments thread was the best in terms of photos.